To ensure all Mercedes-Benz sedans and wagons excel in the most extreme conditions of all four seasons, they are fitted with 4Matic all-wheel drive. 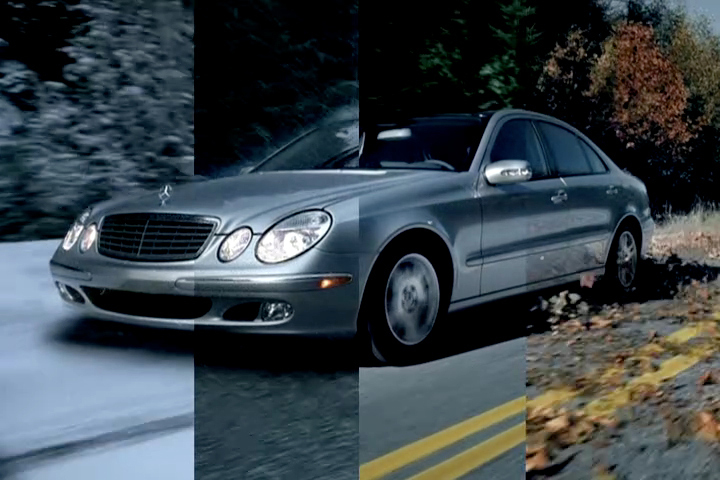 For this ‘Four Seasons’ spot the Flame artists at The Mill New York elegantly split the screen into four vertical strips to show one 4Matic sedan apparently driving simultaneously through four different weather conditions. There's often a heightened realism to the work of German director Juergen Bollmeyer who seeks to reveal grace wherever it occurs, which in this commercial is in both the natural world and the technological excellence of Mercedes-Benz. To exaggerate the seasonal differences, all shot in-camera in Vancouver, BC, The Mill team added more snow, rain, swirls of autumn leaves, and gravel shooting out from beneath the tyres. They also stabilized the car within every shot and for each season - that's 32 shots! Not all of the seasonal shots are intended to line up perfectly, as the slight mismatch gives a more organic feel to the commercial.